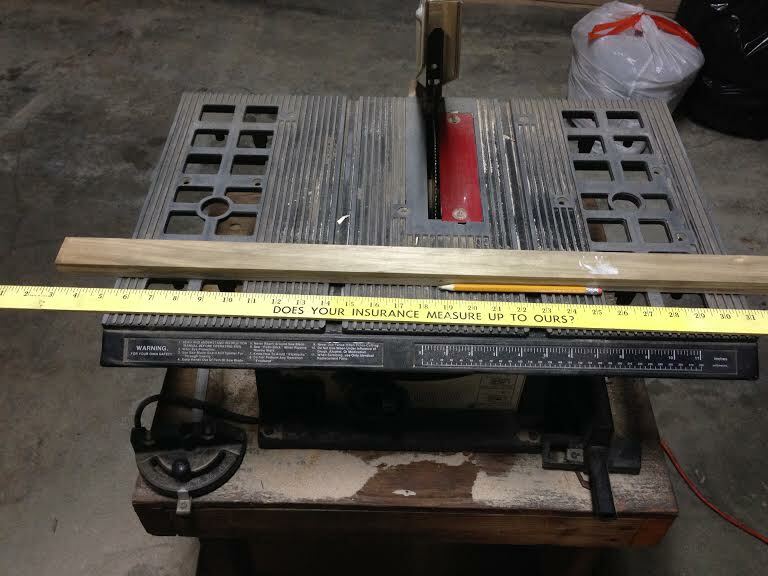 Measuring and cutting the wood on the table saw. 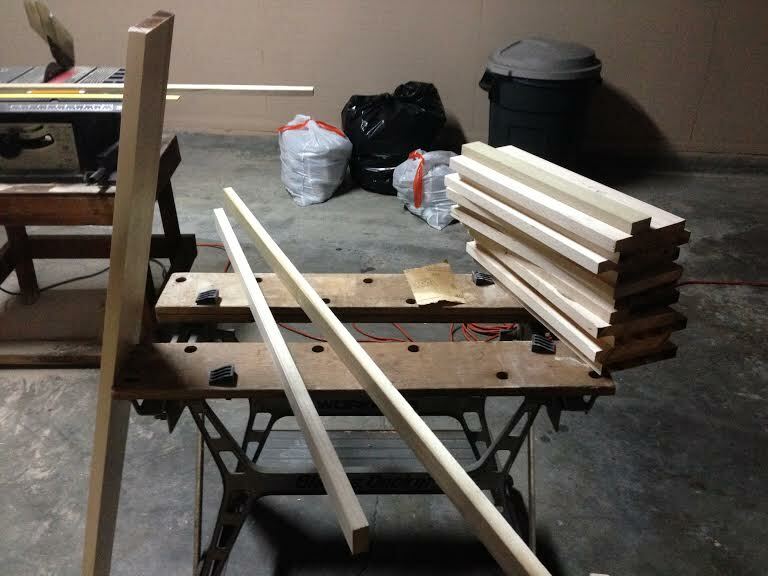 After reading numerous websites about the type of wood to use, I settled on maple and poplar. 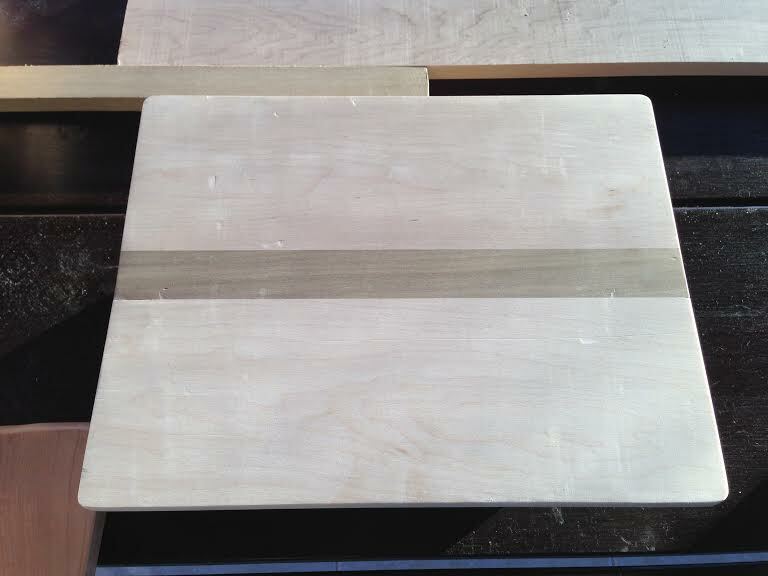 Most cutting boards are made from some type of hardwood, and maple seemed to be the wood of choice for many. I love maple (I have a Big Leaf Maple guitar that I love) – it has a nice brightness to it along with a clean look when it is unstained. I paired it with poplar to contrast a darker, richer color. 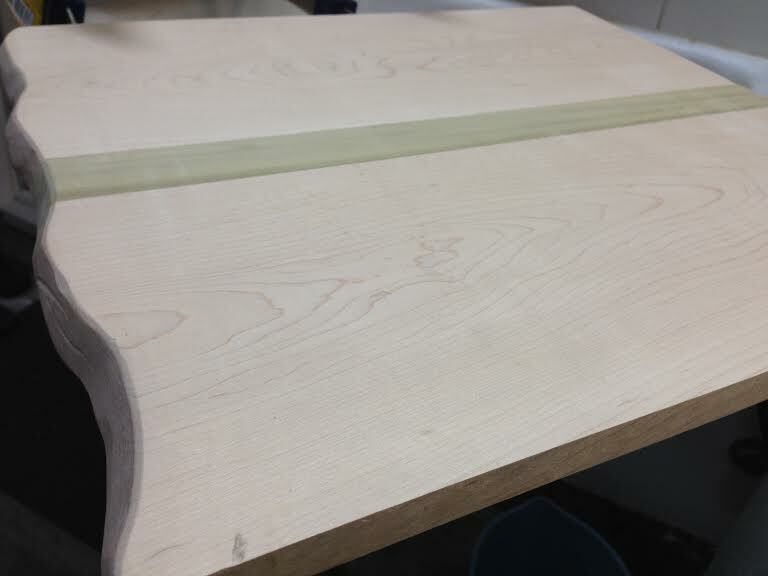 My design was to put a strip of darker poplar down the center of the cutting board (sort of like a wooden surfboard look). I cut all the wood at once, then assembled each cutting board one at a time. 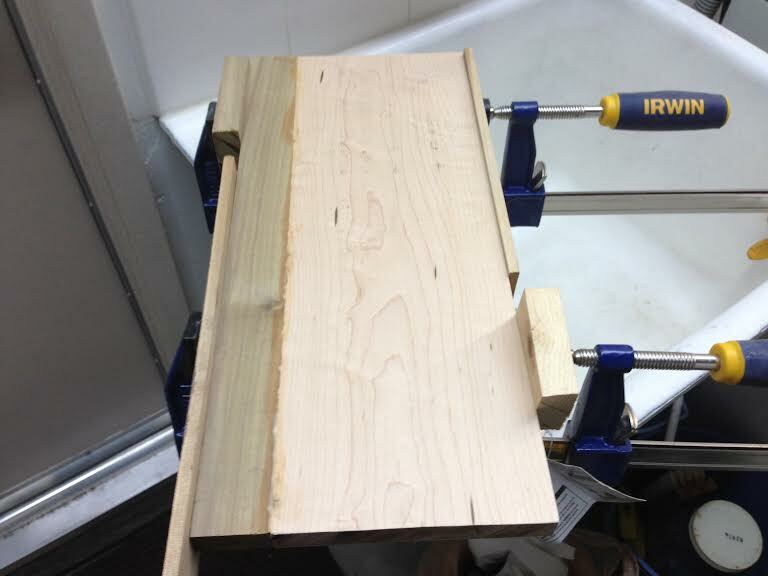 I finally purchased some wood clamps, making the assembly of the cutting boards MUCH easier. I don’t know how I did it before. I would glue one side at a time and leave it for 12-24 hours to dry. There was a lot of dried glue residue on the cutting boards, so you’ll want to wipe away as much excess as you can once you put the clamps on. It doesn’t hurt the board any if you leave the glue, but it makes the sanding step go much faster later. Clamping! You can see the dried glue residue on the seams. This part takes patience because all you can do it clamp and wait… and wait… and wait. Next comes the fun part: SANDING. I don’t know why this is so fun… maybe because you actually feel like you’re making a lot of progress. 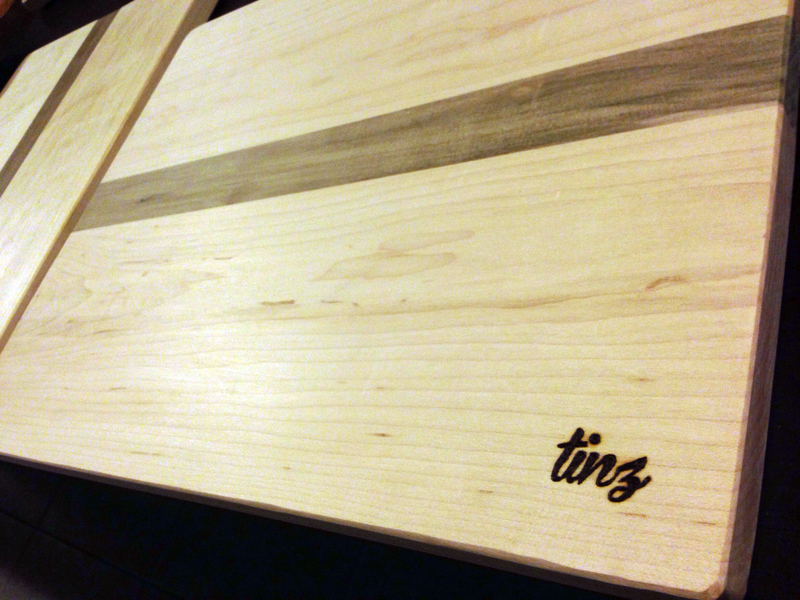 The board goes from chunks of wood to a piece of craftsmanship in one step! I used a belt sander, an orbital sander, and hand sanded (sand paper wrapped around a block of wood) to get my desired smoothness. I started with 100 grit, and worked my way down to 320. I made one bigger board with a “natural edge” for some good friends. It was fun to use the sander to create more of an artpiece out of this one. I ordered a pyrography pen online – a pen with interchangeable metal nibs that heats up so you can burn designs straight into wood. You can find them on Amazon.com or your local craft store like Joann‘s. I bought the Amazon pen, experimented with it for a week, then ordered these nibs to accompany the pen. I ordered the base model, so I assume if you spent a little more, you’d notice a jump in quality. However, the base model was more than adequate for the novice project I would be doing. The handle gets hot after a while, so you can either wear a leather glove or just hold the pen lightly to avoid the uncomfortable heat. If it gets too hot, just put it down for a second to rest your fingers. 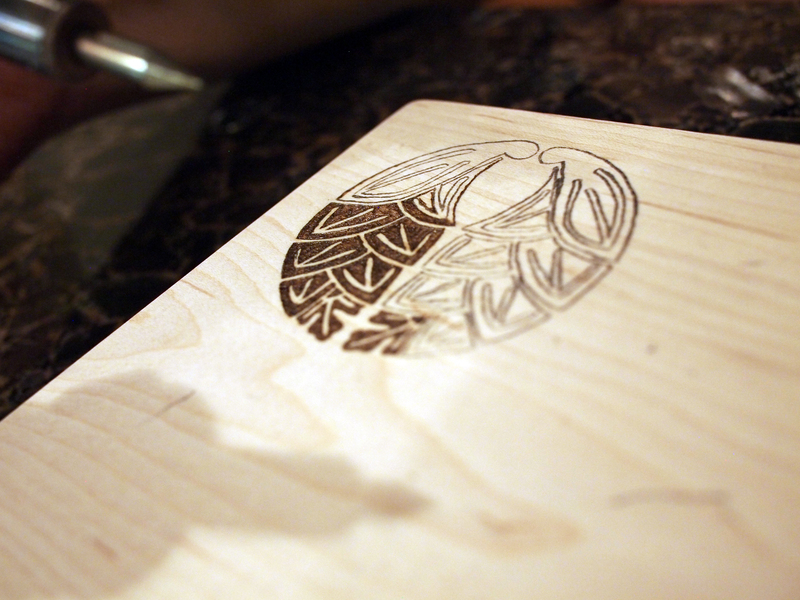 First you draw your design onto the wood using the transfer paper, then go over it with the pyrography pen. If you make mistakes with the transfer paper, you can erase (or sand) it away later. *This is a design with my family crest that I used on one for my mom. It was definitely the most time consuming of pyrography designs. Writing with a pyrography pen is also much different than using a normal pen/pencil. The longer you hold the pyrography pen on the wood, the darker and deeper it burns. I still have not mastered writing smoothly, but I noticed that you can improve as you experiment with different nibs and as you spend more time practicing your penmanship. I believe the key to a “somewhat smooth” use of the pen is the nib you use and the angle of the pen. Unfortunately, that is the best advice I can communicate over a blog. You will have to experiment and figure it out yourself! The toughest part is keeping a steady hand. Finding the right nib for your job is also crucial. The wrong nib will make the mark too deep/thick/ugly, so experiment on practice wood first! I practiced on scrap wood a bunch of times before starting the actual project. I also purchased some transfer paper online – sort of like carbon copy paper, but for woodburning – so that I could create cleaner text on the surface of the wood. Since we wont be burning with a computer or lasers, the pyrography pen will produce an imperfect burn (I call it the “handmade look”), so using the transfer paper will help you have guides for your burning. If you mess up with the transfer paper, it is erasable. Just get a good eraser and go at it. 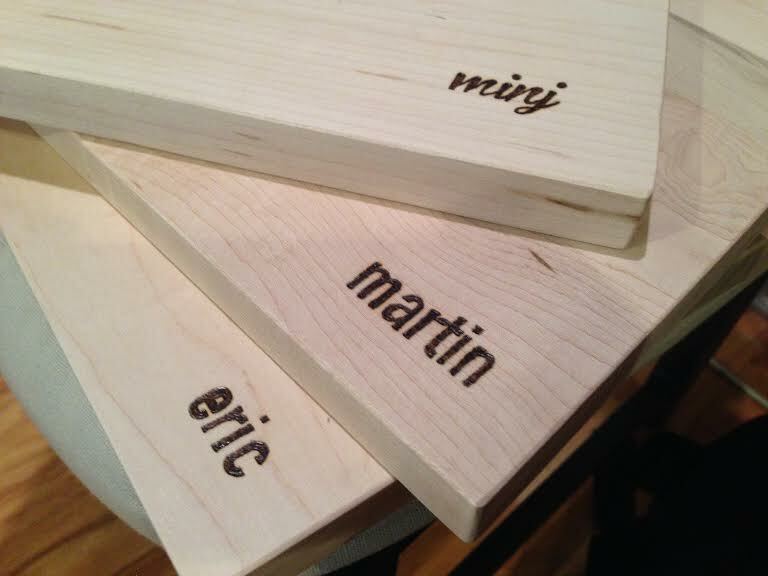 Here are some of the cutting boards I did in the first batch. I used some fonts I liked (script for girls, sans serif for guys). What’s nice about each cutting board is that the grain makes different designs. Each one is unique! 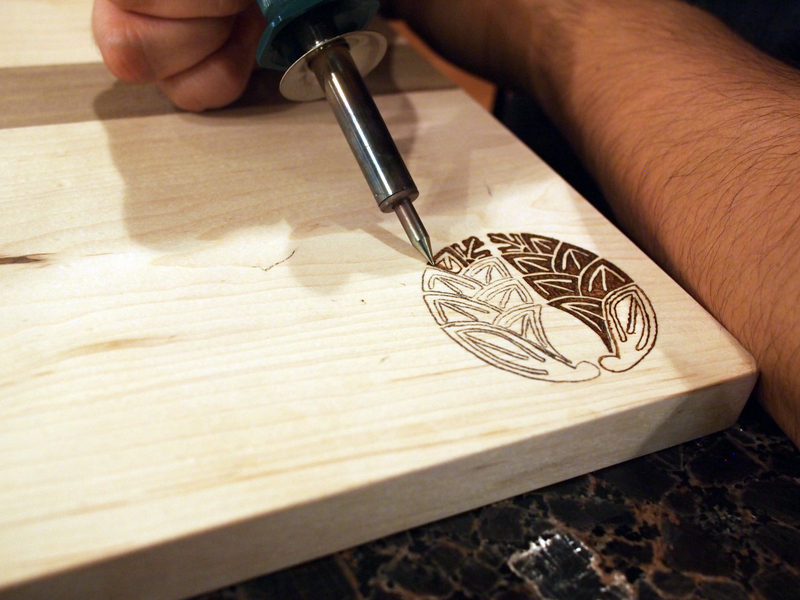 After you finish your pyrography, you can finally seal the deal. 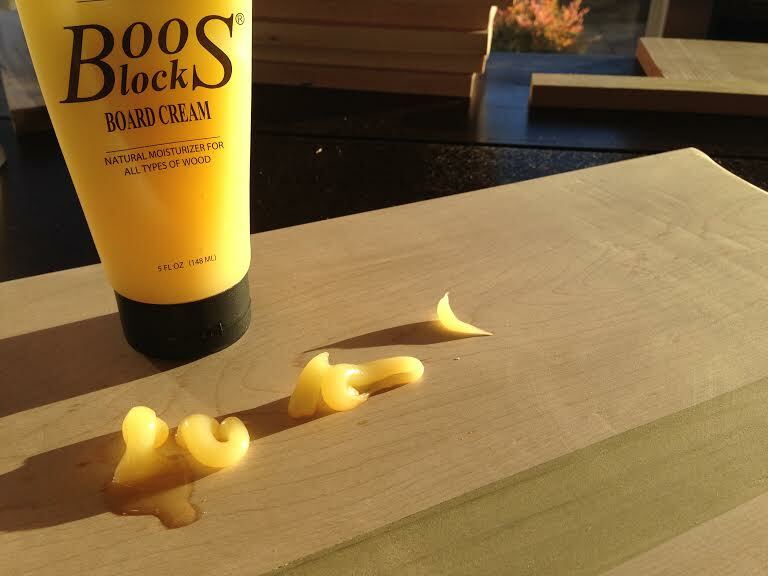 Get some food grade mineral oil, or butcher board cream (I used Boos Block). Either should work great, but I wanted to try the board cream this time because it had beeswax. It seemed like it would condition and protect a little more, and since I was giving these away as gifts, I wanted the first coat of protection to be nice. The last step is the most satisfying. Squeeze it on, and rub it in. You’ll be glad you did. The wax really brings out the colors and grain of the wood. one of the best presents i’ve ever received in my life! Previous PostPrevious 2013 in review of Onigiri Everyday!